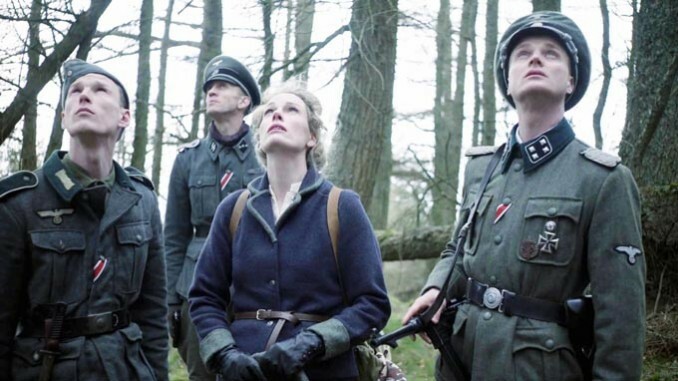 I can’t claim to have had a huge amount of hope for Soldiers of the Damned, the 2015 film directed by Mark Nuttall. The packaging prominently features an SS commander looking stern, giving the impression that this is likely to be – god help us – yet another in the endless stream of low budget Nazi zombie films that have been surfacing in recent years. Thankfully, it’s misleading: this isn’t a zombie film, more a ghost story with elements of fantasy which just happens to be set during the dog-days of the second world war. 1944, the German forces are on the retreat in the face of brutal Russian opposition. Major Kurt Fleischer (Gil Darnell) is hoping to get the hell out of the area and back to safety with the surviving members of his squad, but his plans are derailed when they’re co-opted to accompany scientist Anna Kappel (Miriam Cooke) behind enemy lines. Kappel is a member of the secret German occult institute and is looking for a colleague of hers who went missing while searching for a secret race of proto-Arian deities (from whom, naturally, the Germans are descended). Fleischer’s disquiet about the mission is only heightened when he’s ordered to take SS Major Metzger (Lucas Hansen) – a psychopath whose idea of fun is helping out at the local concentration camp – along for the ride. His men, meanwhile are spooked by the fact that they’ll be venturing deep into a supposedly haunted forest. Naturally enough, the mission ends up a total disaster and they’re picked off one by one as they stumble across mysteriously crushed corpses, phantom Russians, breaks in the space-time continuum and frequent incidences of spontaneous human combustion. 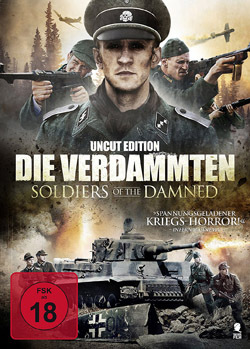 Despite the fact that this is a rather flat looking production – given the locations and the plot the lack of visual style is a real missed opportunity – Soldiers of the Damned is a surprisingly effective little film, one of those productions that has the ability to lodge in the mind after its conclusion. It owes a certain debt to Michael Mann’s The Keep, with the script mixing mysticism and fascism in a second world war setting, not to mention featuring a mutual antagonism between the German Army everymen and their SS peers. As the running time progresses a number of more leftfield elements are thrown into the narrative: a much sought after MacGuffin which emits an eerie light, Kiss Me Deadly (or Repo Man) style; a tank that falls from the sky for no conceivable reason; people being transported to a parallel dimension which is bathed in a sepia light and where they come face to face with their most notable weaknesses. As with most films of its type the acting is variable, with Darnell and Jason Kennedy (as an impressionable sniper) standing out.